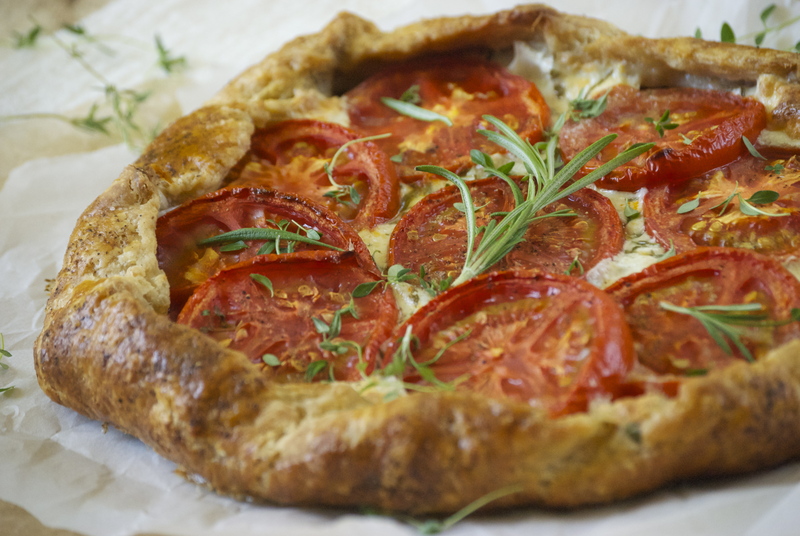 I have just a few more tomato recipes that I want to share with all of you before tomato season disappears with the nice weather. 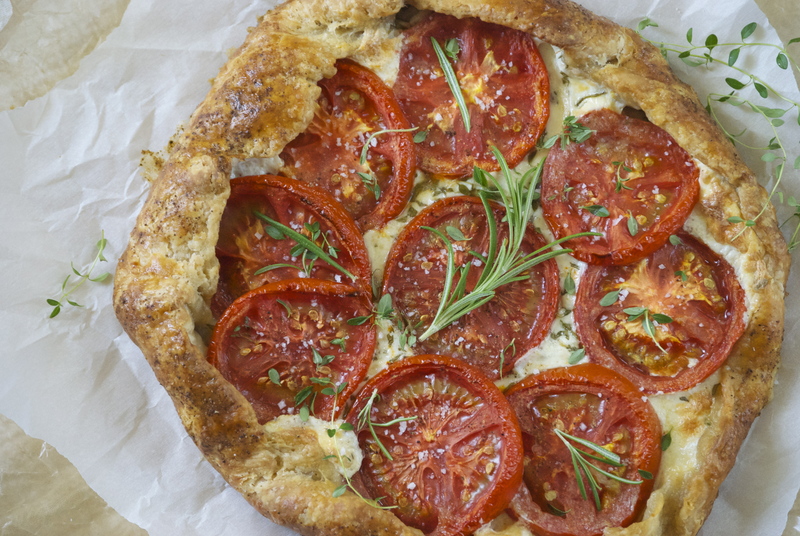 The first is this wonderful Tomato Galette with Herbs and Fresh Mozzarella. As my husband stated after taking a bite, “That’s one of the best things I’ve eaten all summer. Maybe ever”. True story. 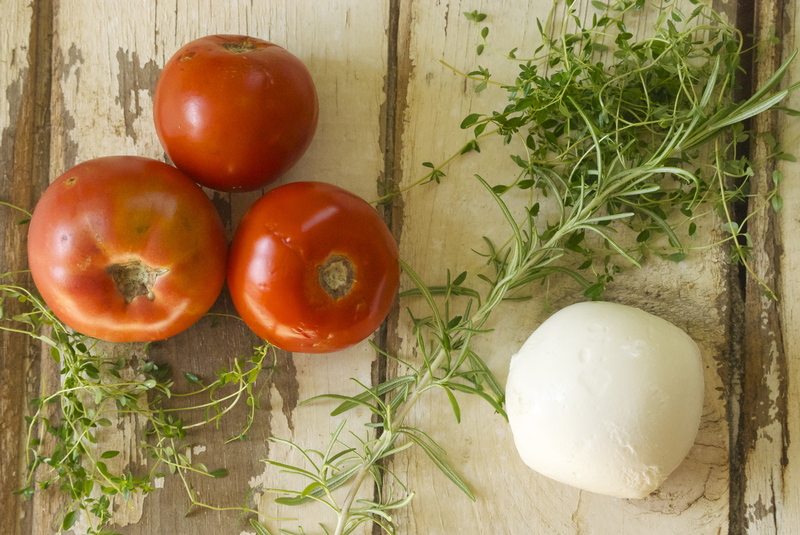 Yes, yes, tomatoes and fresh mozzarella are a heavenly match– we all know that, right? 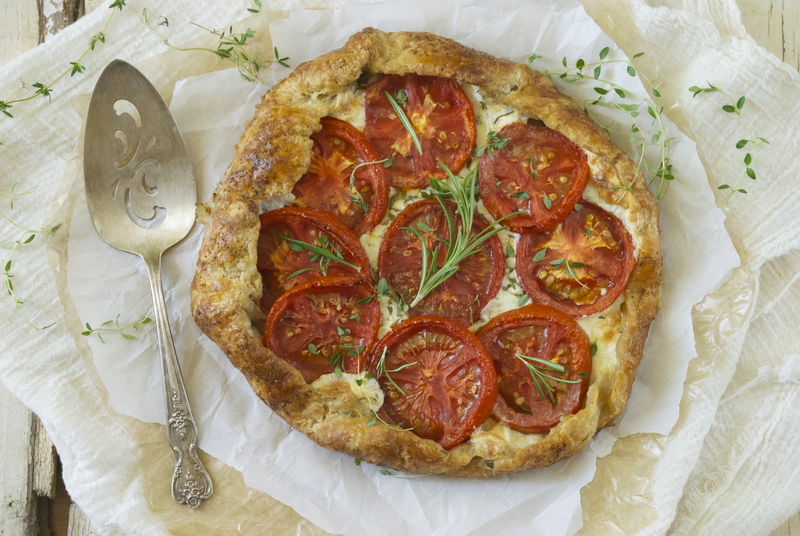 But generally, fresh mozzarella isn’t baked into a galette with tomatoes due to its water content. Much harder cheeses are the norm. Obviously I was a bit hesitant in trying the fresh mozzarella– I had visions of a huge sloppy mess ruining that wonderful crust. There was even a moment during the baking time when I peered into the oven and almost cried. There was a lot of liquid pooling. I was certain the galette was ruined. I mention this, because if you see the same pooling– just wait it out. By the end of the baking time, the water was gone and a beautiful crisp crust was left behind with cheese that had bubbled up into a golden brown. The smell of the the baked tomatoes and cheese with the herbs was unbelievable. This galette comes together so quickly, especially if you have pie crusts hanging out in your freezer (have I mentioned that you definitely should get on that?). And it’s a perfect meal when you want to fancy things up a bit. Add a salad to the side, and perhaps a glass of wine and you’re set. 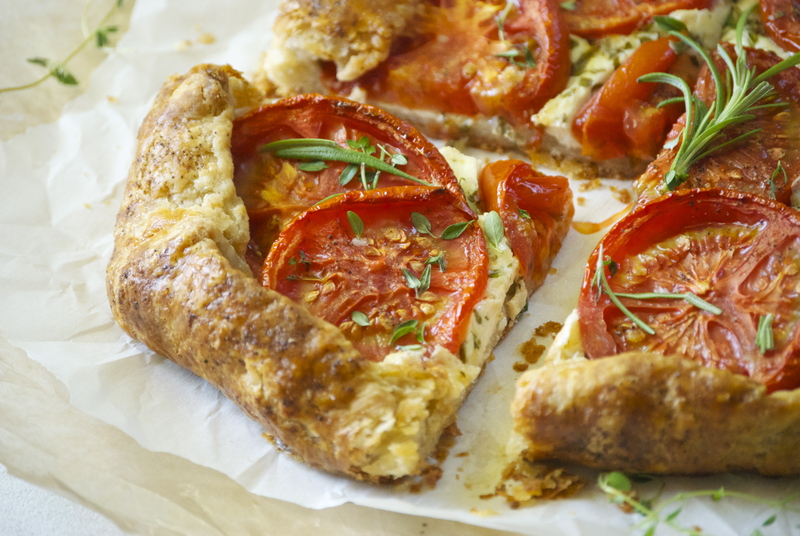 Now go and enjoy the heck out of those tomatoes before they’re gone for the season! Follow the instructions for the All-Butter Pie Crust. After it has chilled it will be ready to use. Roll the dough out into an 11-inch circle (not the typical 12-inch, because I want the crust to be a bit sturdier) on a piece of floured parchment paper. 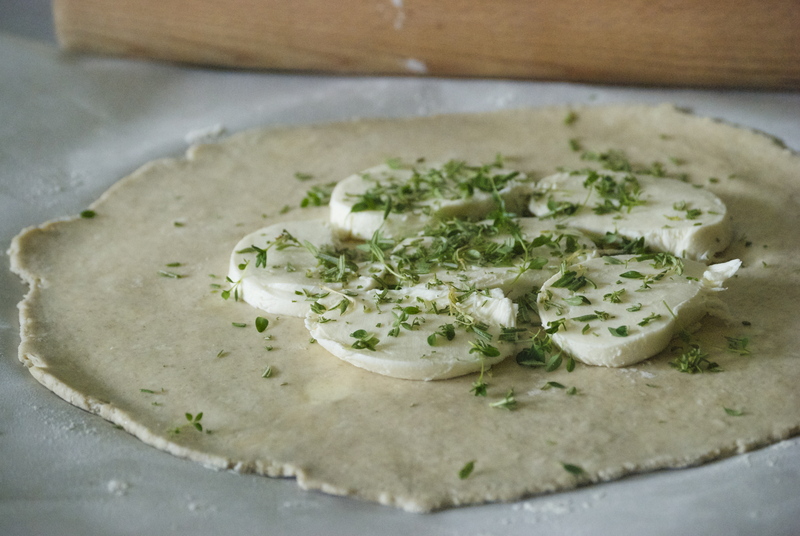 Place the mozzarella into the center of the dough, leaving about 1 1/2 inch border. Sprinkle the chopped herbs on the cheese. Then place the tomatoes on top of that. 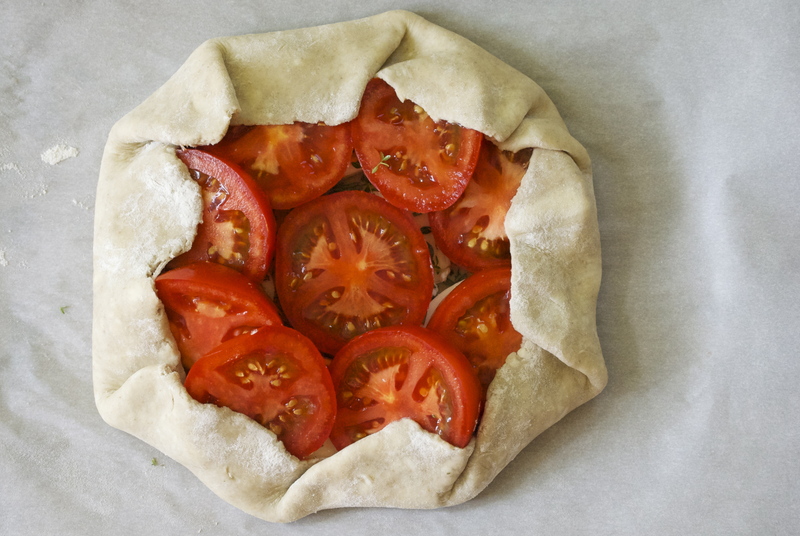 Fold up the sides of the galette and pinch the seams together. Using a pastry brush, apply the egg wash to the dough. Then sprinkle salt and pepper onto the egg wash. Slide the galette and parchment paper onto a large rimmed baking sheet. Bake for 45-50 minutes or until the crust is a deep golden brown and the cheese has bubbled up and browned a bit, too. Remove from oven and let cool for a few minutes. Drizzle with olive oil and sprinkle with fresh herbs, salt and pepper before serving. Enjoy! 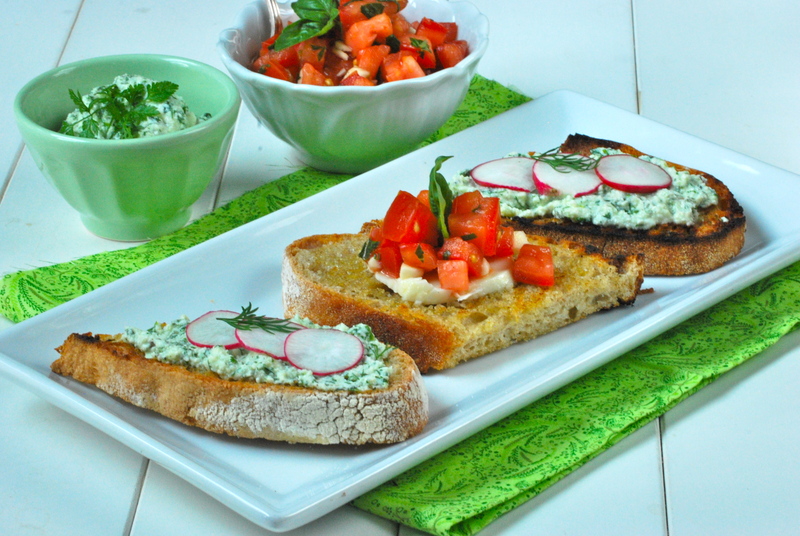 For this post I decided to make crostini from start-to-finish… not just a variety of toppings, but the whole bread-baking process. Yes, it’s easier to simply find a wonderful crusty bread from a nearby bakery (and I often do this), but there’s something therapeutic about baking bread. While it takes more patience and planning, in the end I found it to be so much more satisfying. The smell of fresh bread throughout my house alone convinced me to do this more often. Just look at this loaf! The bread I chose for this appetizer is crusty on the outside, but has a soft-yet-firm interior. It keeps well, which means you can bake it long ahead of time if you’re hosting a party and need to get other things prepared. 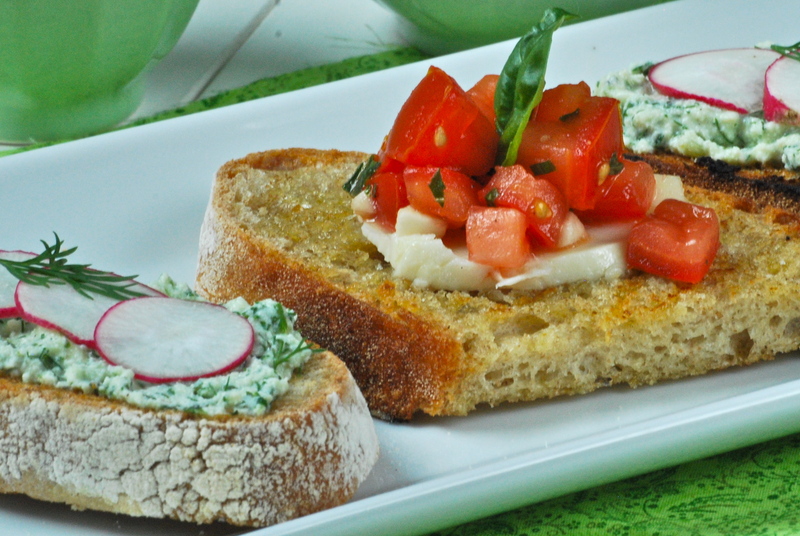 To turn it into crostini, I grilled the bread and added two fresh, colorful, and oh-so-tasty toppings. For the first, I was so happy to be able to use garlic, basil, and a batch of the first tomatoes of the season from our farmers’ market. This is the first fresh-tomato post of the Summer– it will not be the last. For the second, I threw together a simple herbed-ricotta topping with thinly-sliced radishes. I love ricotta cheese, and unabashedly admit that I often scoop and eat spoonfuls while standing in front of the open-door refrigerator. If you can find one locally, buy it. Mixing in the fresh herbs gives it a nice flavor-burst. Put the yeast and water into a large mixing bowl. Stir in 1 cup of the bread flour to make a batter. The mixture will begin to bubble, letting you know that the yeast is working. Let the mixture sit at room temperature for about an hour, until it is frothy and has risen in the bowl. Add the white flour, whole wheat flour, semolina, and salt to the starter and stir well. When the dough is gathered, but still shaggy, turn it out onto a floured counter and knead it for a couple of minutes, dusting with flour if necessary; the dough should remain somewhat sticky. Put the dough in a mixing bowl, cover with plastic wrap, and refrigerate overnight. The dough will rise a bit in the bowl. The next day, remove the dough from the bowl and punch it down to get the air out. Knead the dough again for a few minutes, and form it into a smooth ball. Select a linen-lined basket or low, wide bowl large enough to contain the dough when it doubles in size. Place a linen napkin in a bowl, if that’s what you’re using. I used a regular flour-sack towel and my bamboo salad bowl and that worked just fine. Make sure to dust linen or napkin heavily with white flour before you add the dough. Set the dough ball in the basket or bowl, dust the top with semolina, and cover loosely with plastic wrap. Let the dough rise at a cool room temperature for 2 to 3 hours, or until doubled in size. The longer and cooler the rise, the better the texture of the bread will be. Preheat oven to 450°F – make sure it’s thoroughly preheated! I am a true believer in a oven thermometer. If you don’t have one — pick one up. They’re cheap. Sprinkle baking sheet with semolina. Ease the dough onto the baking sheet by carefully inverting the basket or bowl over the sheet. This part was tricky. Remove the basket or napkin. The top of the dough will have a light coating of flour. Sprinkle on a bit more. With a sharp, thin knife or razor blade, quickly slash a large “X” in the middle of the dough, about 1/2 – inch deep. Immediately put the pan into the hot oven and bake for 15 minutes. The loaf will puff dramatically and the crust will have begun to form. Turn down the oven to 400°F and bake for 45 minutes more, or until the bread is dark and crusty. Remove the bread from the oven and put onto a cooling rack. Wait until the bread has cooled completely before cutting. In fact, this bread gets better the longer you wait to cut into it, unlike a baguette. It will be even better the following day. Mix all of the ingredients in a bowl. Let sit at room temperature for a 1/2 hour or so. The flavors will combine wonderfully. Re-season, if necessary. Handful of mixed herbs, finely chopped — I used, mint, basil, chervil, parsley, chives and dill. Use whatever you happen to have. You should end up with about 1/2 cup finely chopped herbs. Kosher salt and cracked black pepper, to taste. Mix all of the ingredients together in a bowl and let sit for about 20 minutes. Add more salt and pepper, if necessary. Pre-heat the grill. Slice the loaf of bread. Brush with olive oil on each side and top with a sprinkle of salt. Grill for just a few minutes on each side, until you get the color you like. Top with a slice of fresh mozzarella and the tomato, garlic, and basil topping. The bread will soak up the juice wonderfully. Top another piece of crostini with the herbed ricotta and a few thinly sliced radishes. Enjoy with a lovely cocktail, of course! Thanks again for stopping by Relishing It today! As always, I enjoy reading your comments. Let me know if you’ve been busy in the kitchen with any of these recipes. Have a great weekend.